A SECURE BOND is created making baby happy and content close to your warm body where he/she can hear your heartbeat. FREE HANDS for everyday tasks around the home or out in the world. 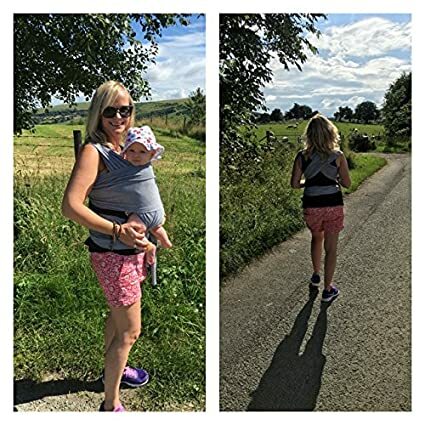 Also a great idea for walking your way back to your PRE-PREGNANCY FITNESS level without the need to find childcare! All this whilst your baby is warm and snug close to you. 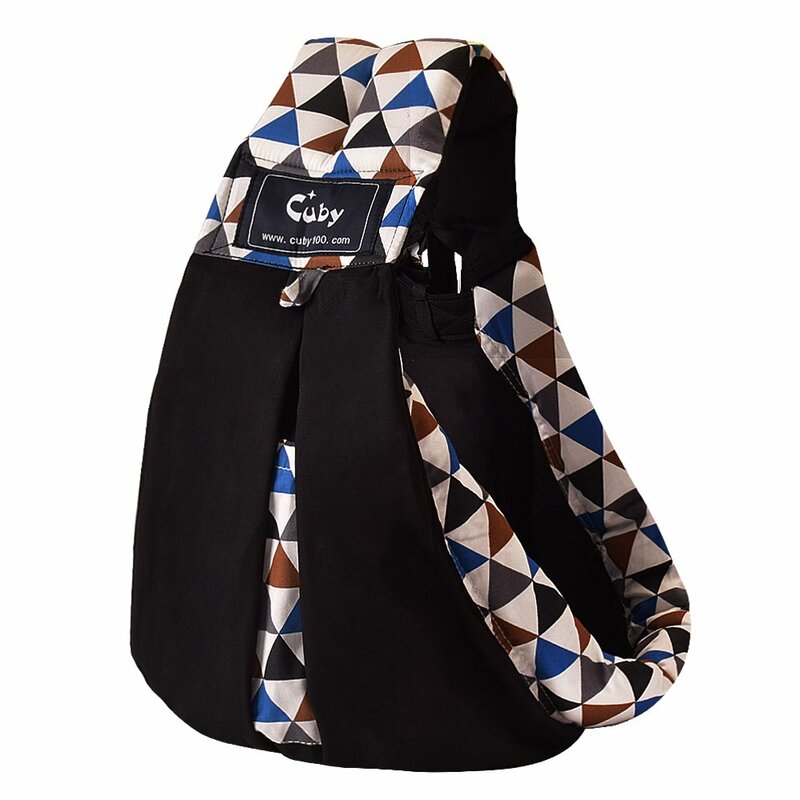 2 SIZE OPTIONS and EASY TO USE versatile design with no straps or buckles - comfortable for both baby and you! Researched and manufactured to the perfect length. Can be used for different holds. Perfect for nursing. Safe for newborns, babies and toddlers up to 35 lbs. Comes in a handy bag so the wrap can be stored away when not in use. EXCELLENT QUALITY in baby soft cotton 95% and 5% spandex. Cool and breathable in dove grey colour. Strong and sturdy for years of wear. Manufactured around baby wearing safety. Machine washable. FULL SIMPLE GUIDE and LIFETIME GUARANTEE. We only recommend holds promoted by UK Sling Libraries, we include access to an easy to follow YouTube demonstration video together with our own unique guide. We are so confident with the quality of our product we offer a Lifetime Guarantee. 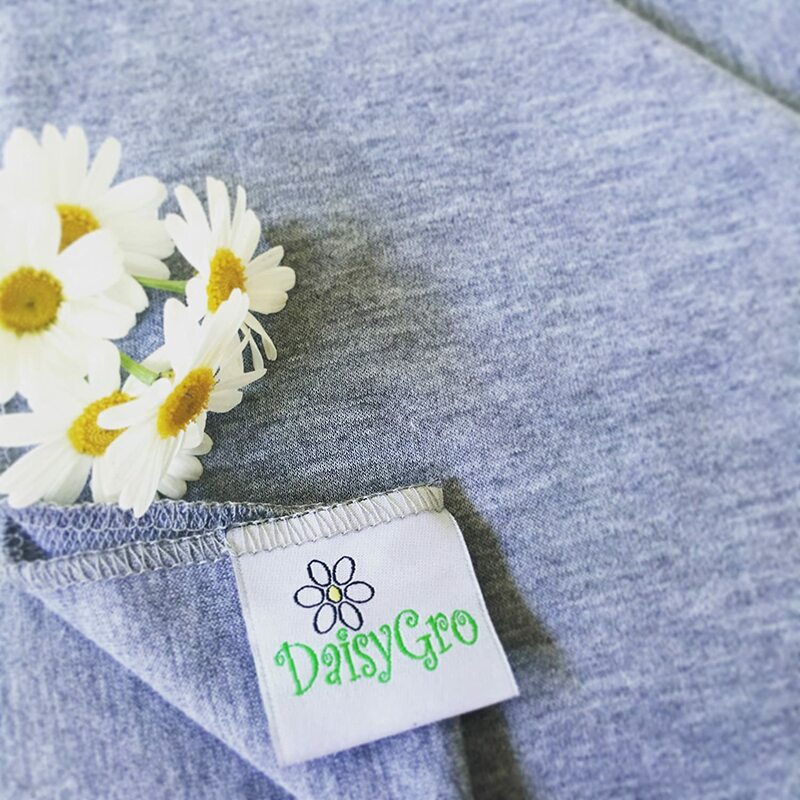 DaisyGro® has arrived from England with our best selling sling in the UK and USA! Now available in Canada in 2 size options, so come and join our growing community today! Your baby's EXTRA SOFT cuddle time carrier provides NATURAL HARMONY for you and your little one. 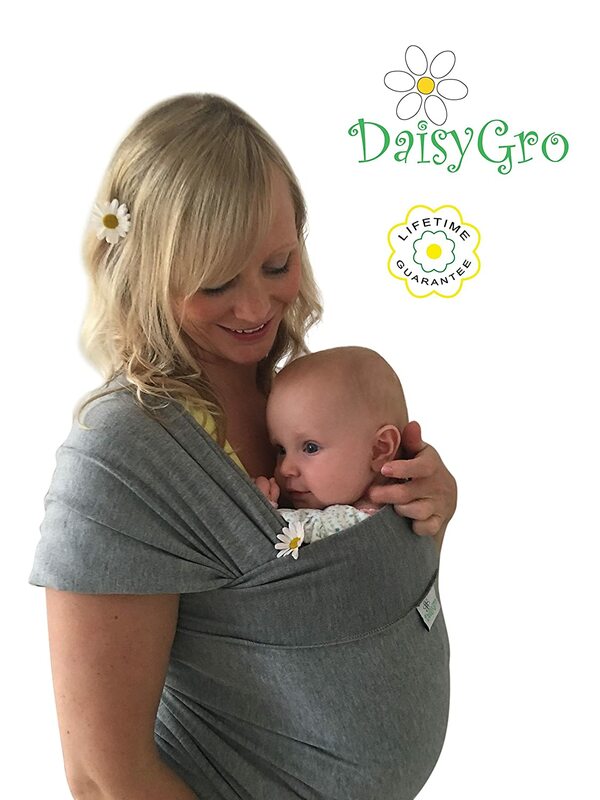 At DaisyGro we pride ourselves by offering the best quality natural cotton baby carrier and provide unrivalled personal after sales support. We only recommend holds promoted by UK Sling Libraries because safety is our highest priority. 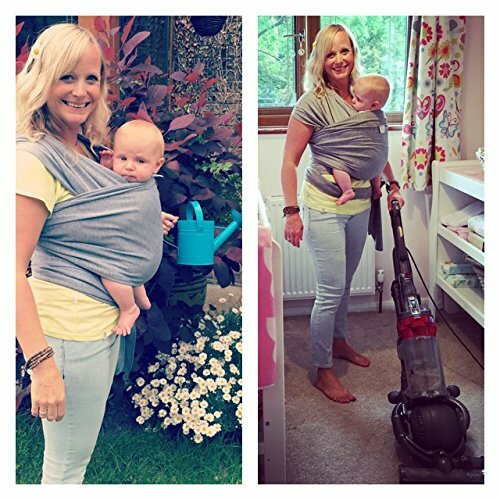 Time spent with your baby is precious - that's why babywearing is so fantastic. Babies who are carried close to your body feel secure allowing that important bond to be strengthened. 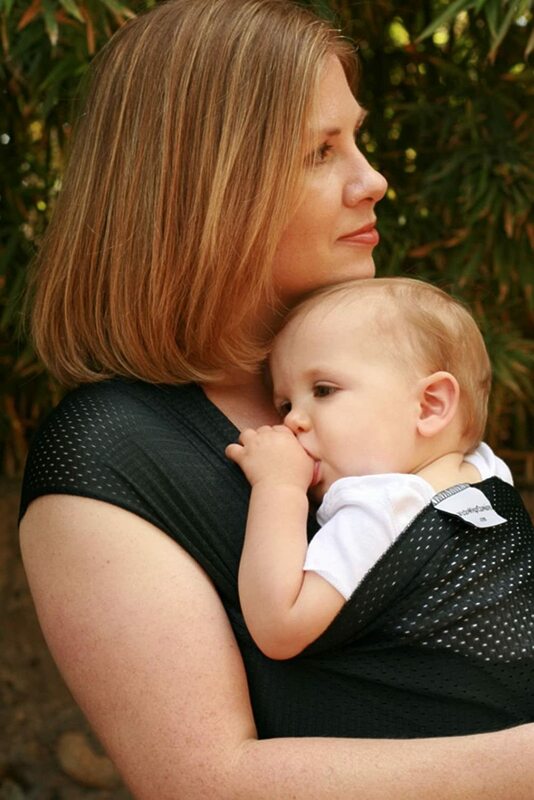 A DaisyGro wrap allows you greater bonding with your baby at the same time freeing up your hands! At last you can get on with the housework, pop to the shops and do your washing! All this with your little bundle of joy cozily snuggled up to your warm body. Our extra soft cotton range not only offers more hold but is softer and kinder to your baby. The carrier is strong yet lightweight and breathable thanks to its 95% soft cotton / 5% spandex blend. Being super stretchy it can easily be adjusted making it perfect for nursing. 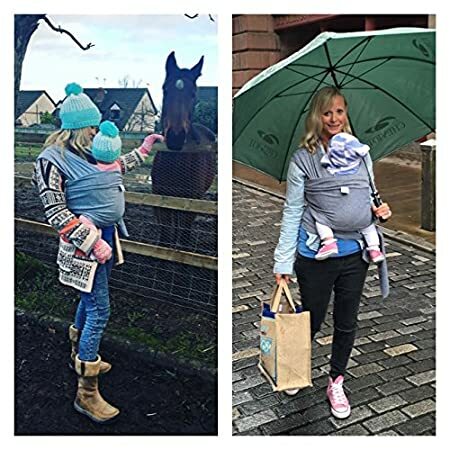 DaisyGro carriers are very quick and easy to tie at the same time being secure and safe. Our wrap can make a lovely gift and in particular a great baby shower gift. Gift wrap and personal messaging is also available when purchasing through Amazon. * Quality extra soft cotton/spandex blend. * Breathable and soft material making it cool and comfy for you and your baby. * Safe for newborns, babies and toddlers up to 35lbs. * Easy to use - no complicated straps. * Stretchy material perfect for nursing. * Help ease the discomfort of colic/reflux. * Comes in a handy bag. I am a first time user of baby wraps with my second child. I am absolutely in love with this wrap!!! It is so comfortable and it definitely puts baby in a very natural position. I wear him around the house to get house work done or when playing with my toddler. He usually falls asleep pretty quickly when I put him in, so I am assuming he also enjoys the comfort of the wrap and the closeness it provides. I have tried a carrier, but I find it is uncomfortable for my 2 month old. He never settles in the carrier and he is not held as close as he is in the wrap. Thank you for a wonderful product at a great price, my son and I both enjoy it. Nice packaging~ works perfectly as described. Had to watch youtube videos on how to properly use the wrap as instructions were not 100% clear. Other than that, great quality and even received email communications on how to use product. Would recommend for all moms/dads who need to keep their hands free during the day especially for fussy babies. Love this wrap. Other than the usual annoyance with putting on a wrap (which all wraps have), it's very easy to use. The stretchiness of the fabric is perfect, easy to get baby in and out of without bending legs too much. 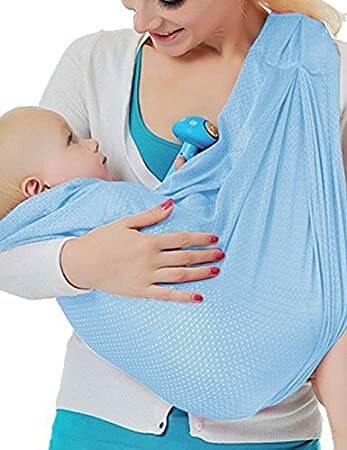 When using with my no-head-control newborn, i just keep a hand lightly on his neck/head, leaving one hand fully free and the other not straining under weight. Kinda wish the centre had a more noticeable element, like a pattern or color or something, as the little tag can be difficult to find when it's a bundle on the floor, but that's minor. This wrap IS AMAZING!! 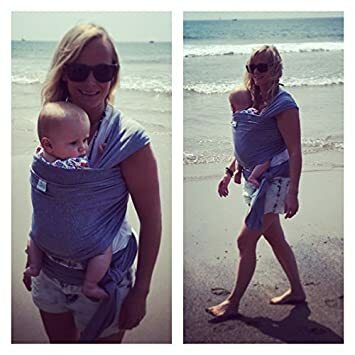 I have an ergo carrier and paid a hefty amount of money for it, but it was not distributing the weight of my baby well enough across my body that I was not in pain, but this wrap is heaven sent. Its soft, comfortable and pain free for me and my back!! Baby is comfortable and loves being in the wrap. And getting it on is a breeze!!!! Best purchase!!!!! Mail and still remembered how to donn it independently so I was really happy with that. Only worry is if I could get it tight enough to feel comfortable with baby in it. Amazing product! Iu2019d recommend this to anyone. It literally arrived the next day after I placed my order. Itu2019s soft, stretchy and the tutorial on how to use the sling is the most helpful one Iu2019ve seen. I ordered the xl size just in case, to have the extra material. Itu2019s long but that just means you can wrap it around and donu2019t have to ever worry about running out of material. 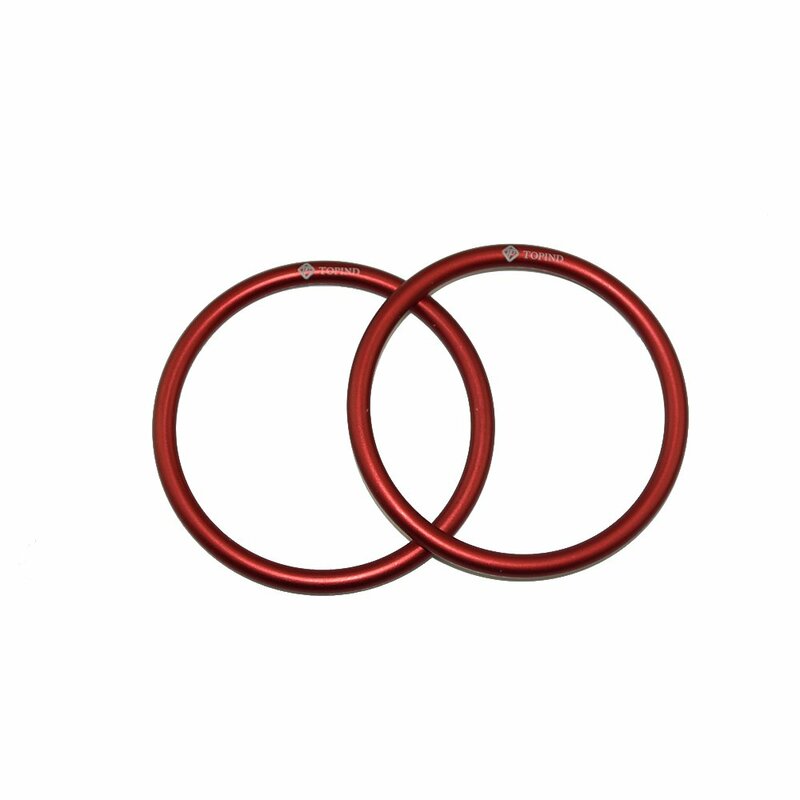 Topind 3 Large Size Aluminium Baby Sling Rings for Baby Carriers & Slings of 2 pcs (Black) Shanxi Top Industries Co. Ltd.